Victoria Kincaid, an author whose stories I love, is my guest today. Her latest book, The Unforgettable Mr. Darcy, is the spotlight for this post. Ms. Kincaid shares an excerpt with us, and it has made me ready to read the book. I was already eager, but now I'm even more so. I hope each of you enjoy the excerpt as much as I did. There is a giveaway too, so be sure to leave a comment. Victoria, I turn it over to you. Hello, Janet, and thank you for having me to visit! The plot for The Unforgettable Mr. Darcy has been rattling around in my head for years, and I’m so happy I can finally share it with readers. This scene is set shortly after Elizabeth awakens and discovers she has amnesia. I hope you enjoy it. When she next awakened, William sat in the armchair reading a book. He sprang to his feet the moment she stirred. Elizabeth placed her hands on her hips indignantly. “No strawberries?” William’s eyes widened with near panic until Elizabeth ruined the effect by laughing. At the mention of food, Elizabeth’s stomach rumbled. “I believe that is your answer,” she said with a smile. “Soup would be welcome—and bread if they have it. And tea. Tea would be lovely.” She could focus her attention on food and forget the agitation over her missing memories. Was she indeed this sort of person? How strange not to even be aware of her own nature. William knew her better than she knew herself. A tight panicked feeling fluttered in her chest. What would she do if she never recovered those memories? Thank you for stopping by More Agreeably Engaged and letting me share in your new release. I have been excited and looking forward to today ever since receiving your email. The excerpt was touching and heartrending and I'm eager to get started on the novel. I loved your first book, The Secrets of Darcy and Elizabeth, that had Darcy and Elizabeth in France. That makes this one all the more intriguing to me. Another book by Victoria Kincaid, Mr. Darcy to the Rescue, was a MAE 2015 award favorite. To read my review of it, click here. When Mary Met the Colonel, also by Victoria Kincaid, was a MAE 2016 Awards winner. Victoria Kincaid is offering one eBook or one Paperback, winner's choice of The Unforgettable Mr. Darcy, and the giveaway is international. Isn't that wonderful! Thank you, Victoria. My readers and I appreciate your generosity. To be entered in the giveaway, please leave a comment. Be sure to include your contact info, unless you know I already have it on file. Thanks for dropping by and commenting. Good luck to everyone. The giveaway will end at 11:59 P.M. on the 9th of August. Congratulations on you new release! Thank you for the fascinating excerpt and the chance to win a copy. Hi Virginia. Thanks for stopping by and good luck. Isn't that an interesting premise! I'm anxious to read more. Love this excerpt and the way that Elizabeth's sense of humour resurfaces even though her memory hasn't. In fact, I loved the whole story! No need to put my name in your giveaway hat, Janet. Her wit is just natural, isn't it. Glad to hear you loved the whole story, Anji. I can't wait to read it myself. I will not include you in the giveaway. Hi Vesper, Yes, therein lies a plot! Good luck with the giveaway. Hi Jennie, Thank you for being a faithful reader and good luck with the giveaway! I loved that book, too, Jennie. It had such a different premise. Your name is in the draw. Thanks for stopping by. Thanks for dropping by, Denise. Good luck. Oh,what a lovely excerpt! I feel sorry for Lizzy having amnesia and feeling so confused about the essentials of her life. Not sure how she's going to react when she finds out the truth about Darcy.....not I'm certainly looking forward to finding out! Best of luck with your book,Victoria. Thanks for popping in, Mary. Isn't that a neat excerpt. I can't wait to see how this is all going to play out. Good luck with the giveaway. Janet, this is a wonderful excerpt and I'm looking forward to reading Victoria's new book. Thanks for featuring her here! It was my pleasure, Jen. I'm looking forward to reading it too. I'm glad you stopped by. Janet, thank you for hosting this delightful post and excerpt. Poor Elizabeth and poor Darcy as they try to sketch each other's character. I can't wait to read this. Thanks to Victoria and her publisher for the generous give-a-way. Good luck to everyone in the drawing. You are welcome, Jeanne. Wouldn't that be a difficult thing? I feel so for both of them. I can't wait to read it either. Good luck in the giveaway. Her husband??!! Can't wait to find out where that came from. So Elizabeth has awoken and believes she is married to Darcy? I really hope her sense of humour lasts when her memory returns and that she realises what a good, caring man Darcy is. Thank you so much ladies for sharing this excerpt and for the giveaway. Just a delightful excerpt! So glad Elizabeth's sense of humor has not altered! Wasn't it delightful! Her sense of humor is one of the things that is always fun to read. Love the excerpt! Looking forward to reading Victoria's new book. It was a good excerpt. I'm looking forward to reading it too. Good luck, Joan, and thanks for dropping by. Lovely excerpt. Putting this on the TBR pile. Its's on my pile, too, Patty. Good luck in the giveaway! 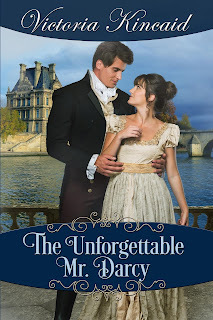 I've been following along Victoria's enjoyable blog tour and reading all the entertaining and exciting snippets of The Unforgettable Mr. Darcy. Thank you for choosing this excerpt that continue on from your previous blog visits, Victoria. Did I skip a blog because I haven't read about the first time Elizabeth was conscious after her injury and find herself in a strange surrounding. I can't answer whether a blog post was skipped or not. Victoria may be choosing some excerpts out of order, but don't know. I'm glad you stopped by, Sylvia. This was an exciting snippet, wasn't it! I thought I had commented on this blog already, but since I don't see it I may have been mistaken. Poor Elizabeth, having to cope with such total memory loss that she doesn't know what sort of person she is! it is interesting to learn about oneself through the eyes of another, though. I agree. I always look forward to Victoria's books. This one sounds wonderful and I can't wait to read it! Good luck in the giveaway.